This is a guest post from Coach Wes Kosel. You can follow him on Twitter at @coachkosel and check out his blog www.hoopschalktalk.com which specializes in the X’s and O‘s of basketball coaching. 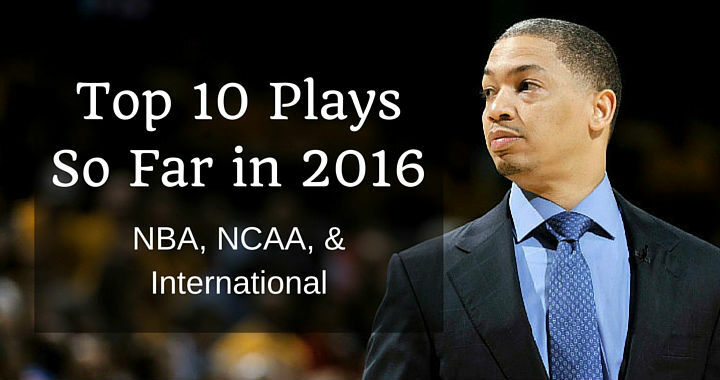 2016 has been a big year for basketball all over the world already. We’ve had the Cleveland Cavaliers win the NBA Championship, the Villanova Wildcats claim their 2nd National Title, and there’s still plenty more to come. One of the things that continues to stand out is how the strategy coaches are using continues to evolve and improve. Coaches like Brad Stevens, Tyronn Lue, Gregg Popovich, Jay Wright, and many more continue to prove their brilliance with new plays and actions that are leading their teams to success. Ron Baker shows the value of cutting hard in this play. After setting a down screen, Baker comes off of a cross screen and looks to throw the ball inside to the post. The play begins in a 1-4 set with (2) higher on the wing. 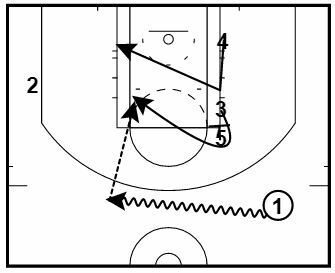 (2) sets a diagonal screen for (4) who pops out to the wing and receives the pass from (1). Immediately after (2) sets the screen, they receive a cross screen from (5) and cut out to the lower wing and receive the pass from (4). (4) and (1) now sprint and set a staggered screen for (3) who cuts to the top of the key looking to receive the ball for the shot. The other option is (5) who is now posting up. Toronto used this play in the NBA Playoffs against Miami. The cutter turns down the staggered screen and makes a cut to the rim. 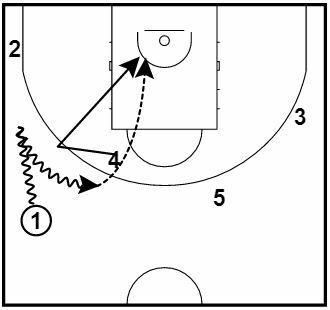 The bottom screener then curls around the top screen for a shot in the lane. The play begins with the point guard dribbling to the opposite side of the floor from the stack and with (2) on the ball-side wing for spacing. (3) and (5) set a staggered screen for (4) but (4) rejects the screen and cuts towards the rim to the ball-side block instead. (5) then sets the screen for (3) who can then either pop out to the top for a jump shot or curl around the screen for a layup depending on how their defender plays the screen. The Spurs are a beauty to watch on offense with their movement and spacing. In this play, the point guard dribbles towards the wing pushing the corner guard into the lane. 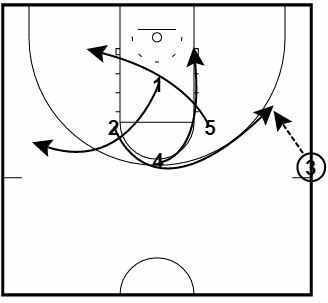 This spacing creates a two-man action for a pick and roll, pick and pop, etc. To start the play (1) dribbles to the wing which triggers (2) to set cross screen for the trailing (4). After screening, (2) clears out to the weak-side corner while (5) also clears out the ball-side of the floor by moving to the opposite block. This puts (4) in a great position to set a screen for (1) where they can run a number of two-man actions. This quick hitter gets a wide open layup for Pau Gasol. Gasol slips the drag screen as his defender tries to jump the action. 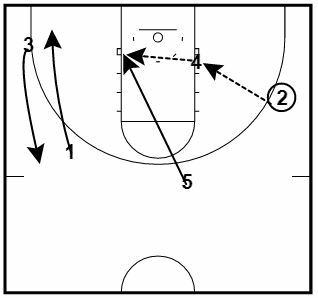 This simple play starts with (4) setting a drag screen for (1). (2), (3), and (5) make sure to play high and spaced out to create the necessary spacing. 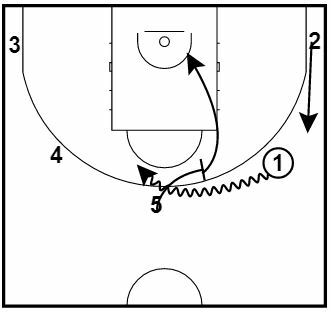 Immediately upon setting the drag screen, (4) slips to the ring and receives the pass from (1) for the layup. Villanova used a horns series throughout the NCAA Tournament. 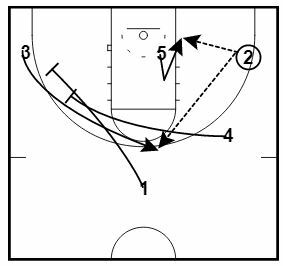 In this option, Coach Wright rolls the ball screener off of the opposite horns post into the lane. Once the ball is in the post, the opposite big dives down the lane for a dunk. The play begins in a horns set with (4) and (5) at the top and (2) and (3) spacing the floor in the corners. The point guard uses the screen set by (4) and then (4) immediately curls around (5) and cuts towards the basket. The basketball is there reversed around the three-point line to (2). (2) passes into (4) who is now posting up. (5) dives to the rim for the easy layup while (1) and (3) exchange to keep their defenders busy. Kansas saw a lot of zone defense in the NCAA Tournament. In this play against UCONN, Perry Ellis does a great job moving around to an open spot in the middle of the zone. Once Ellis has the ball at the high post, the middle defender steps up leaving Lucas wide open for two points. This zone play starts with a two-guard front, one player on the wing, one player on the high post, and one player on the low post. The two guards at the top reverse the basketball twice to get the defense moving. (2) and (3) then exchange on the wing and (1) passes the basketball to (3). (3) then dribbles across the top of the key and performs a dribble hand-off with (1). (1) immediately looks inside to (4) who has positioned themselves between the top defenders to make the pass available. As (x5) is forced to step up and play (4), (4) performs a simple drop down pass to (5) for the layup or dunk. Mexico gets a huge lob dunk out of this play by spreading the floor and using a high ball screen. As the big man rolls to the rim, the corner player lifts up from the corner forcing his defender into a tough spot. The play begins in a 5-out spread with (1) dribbling the basketball on the wing. (1) dribbles towards the top of the key and receives a screen from (5). (5) immediately rolls to the basket looking for the pass while (2) on the wing lifts up from the corner to the wing. Since (2)’s defender is the defender helping on the roll to the rim, this puts them in a difficult position and they must make a decision whether to help on (5) or stay with (2). Coach Brad Underwood ran a variety of plays out of the 2-guard front, or 2-1-2 set. In this play, the big bumps on the second cut and the guard stops at the high post for a pinch post ball screen. The play begins in a 2-1-2 set with (1) and (3) at the top. (1) performs a dribble hand-off with (2) on the wing as (3) and (4) exchange on the weak-side wing. (2) then passes to (4). Upon passing, (2) cuts through to the ball-side corner and (4) makes the pass to (3) on the wing. (5) then sets a back-screen for (1) but bumps to the ball-side low block while (1) stays on the high post. (3) then reverses the basketball to (4). (4) then receives a pinch post ball-screen from (1) and has a lot of court space to drive or pull-up for the shot. Coach Gard called this play with 2.0 seconds left in the NCAA Tournament against Xavier. The players circle around and Koenig cuts to the wing for a 3-point shot. The Badgers won the game with this play. 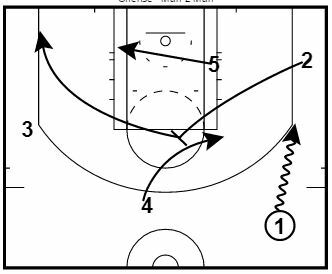 This play begins with (3) inbounding the basketball and the other 4 players in a diamond. Upon (3) receiving the basketball from the referee, all players rotate around in the same direction to confuse the defense. (3) then inbounds to (2) for the corner shot. Cleveland went to this horns series several times in the NBA playoffs and had a ton of success with it against Toronto. In this option, Richard Jefferson gets open for an alley-oop from LeBron James. The play begins in a 1-2-2 set with (3) and (4) on the high posts and (2) and (5) in the corners. (1) makes the pass to (3). (1) then cuts and sets a flip screen for (4) who then cuts to the rim and receives the pass from (3) for the score.